Submitted by Elizabeth Smith to V.D.C. A mythical cannibal monster with characteristics of a human, or an evil spirit whom has possessed a human and made them monstrous. The Wendigo is associated with cultural taboo and fears, including cannibalism, murder, and insatiable greed. They were associated with winter, the north, coldness, famine, and starvation. They constantly search for food, appearing emaciated, fresh from the grave, with bloody and tattered lips. Whenever one ate a person, it would grow in proportion to the meal it had just eaten, so that it could never be full. Therefore, wendigos are portrayed as simultaneously gluttonous and emaciated from starvation. There is also a medical term ‘Wendigo psychosis’, a culture-bound syndrome. Alkonian Indian’s first began to show psychosis symptoms during the winter. Typically while being hungry from little nutrition, as trade routes with various foods were cut off, not storing enough supplies, and being trapped in shelters due to the cold. Typical psychosis symptoms begin, including craving for human flesh. This must have been a cultural taboo and fear amongst the people, and of course, the only way to rid themselves of the disorder in their belief, was to eat human flesh. Resulting in cannibalism. They believed so strongly in the existence of the Wendigo, they felt it controlled these symptoms and that if the symptoms began, one could even turn into one. A cultural fear manifesting into the symptoms of psychosis. The first sightings were of soldiers from the Kamensk Military Base entering the fields above Severograd. Reported July 7th, a Russian helicopter was flown into Kamensk Military Base, spreading major outcry. July 8th, citizens of Nagornoe and Kamensk rounded up for ‘their own safety’. Nagornoe citizens moved to Severograd. Kamensk citizens disappeared completely. Rumor was they were taken to the military base either to be held or killed. Around midnight on July 8th, Russians suddenly pulled all personnel from Kamensk Military base, returning all personnel from the area, immediacy back to Russia. On July 10th, in the early morning, Russian Air Force flew in and annihilated Kamensk Military base, killing 50 Chernarussians. Hours later, an emergency call to police stated that there were men staggering from the forest and attacking livestock. They were described as unresponsive, rabid and violent. Accounts stated little, other than it was noted that the men appeared to be military, and had severe injuries. Including third degree burns, and traumatic amputation of limbs. Reports state that even with these injuries, they moved as if they felt no pain at all. Russian artillery hours later launched an attack at low populated areas of Kamensk, Nagornoe and Severograd. While the bombing was intensive, it left little actual damage, leading locals to state that it appeared as it if it was some kind of distraction. The bombings caused hundreds, if not thousands of unresponsive and rabid soldiers to appear, flooding Severograd. While the streets were in panic trying to settle the unresponsive, violent and injured soldiers; Severograd hospital seemed to be dealing with what appeared to be some kind of CBRN (chemical, biological, radiological and nuclear) attack. The hospital became filled with people suffering from strange symptoms: haemolacria being a major symptom, along with a skin rash resembling cellulitis, also similar to poison oak, excluding a thick sap-like semi-clear and bloody pus. Other symptoms included hemoptysis of black bile (digested blood, usually leaking from the alimentary canal), fever, and flu like symptoms. Overnight, all contact with the hospital ceased entirely. Reports came of everyone inside the hospital that could be seen, was now also acting in the same unresponsive, rabid way. This induced panic and people began to flee, as well as borders shutting down. But it was too late and infected people flew to areas all over the world, spreading the pandemic. Kamensk Military Base was discovered as the theorized point of origin for the Wendigo Virus by my studies. At the time, it was widely assumed to be Tisy, the largest of the military bases. Once I lined up the news and history on the base, it made sense. I discussed my findings with Doctor Tyrus Mason of the World Health Organization, and then via his insistence, Col. Jack Ripley. Due to my findings, Ground Zero was now Kamensk Military Base. An expedition was mounted by the United Nations and the World Health Organization, led by Kristian Holman, and WHO researcher Dr. Faith Capella. Findings indicated confirmation Kamensk was officially Ground Zero. The origins of the base being in the Soviet Union, well hidden, and the events leading up to the multiple bombings in the area by Russia, as well as the unleashing of an epidemic, lead me to believe the events were no accident or coincidence. The base was held in control by the Soviet Union until its disbandment, then passing to the hands of the Chernarussian Defense Forces. It then disappeared from the public eye and for the most part, public record and memory. Until July 7, 2017. The Russian helicopter flying in provoked outrage of the public. We don’t know why the Russians visited the site. Only that the base held a combination of Chernarussan and Russian troops whom had been working together. The next day, July 8th, people from both of the closest cities were rounded up and escorted elsewhere. Visually they would have been able to see the helicopter entering the base. The citizens of Kamensk were removed, and never seen again. Public outcry believes they were taken to the base and held captive or executed. Later, the UN found a sealed pit of bodies during their investigation. Descriptions say injuries consistent with grenade damage. Oddly, the tunnel was also welded shut from the inside. The night of July 8th, every Russian personnel was pulled from Kamensk military base and the surrounding area, and immediately returned to Russia. Two days later, in the early morning hours of the 10th, Russian planes bombed Kamensk base to rubble. Hours later, the people of Severograd reported the first sightings of what we call ‘infected’. While unable to reach this man again, or find his full name, during my travels I ran into a Chernarussian gentleman who claimed to be 92 years old. His claim looked valid. While ornery, his speech and memory had no distinct flaws indicating of dementia or memory related illnesses. He recounted multiple wars in the area, having fought in the major ones, even helping to build Kamensk base. He claimed to be a citizen of Kamensk, and that he had been away for several days, only to hear the news and return to an empty city. After the bombings, he claimed to have gone to personally investigate Kamensk base. His findings claimed two very interesting things. First was that any and all paperwork, communications, records, etc. relating to Russia was missing. The bombing was sudden and unexpected, meaning no one would have had time to clear out papers, and any left behind, would end up under rubble or other areas. This was not the case. The CDF claims to know nothing about the missing paperwork. The only logical suspicion, would be that all of these documents and papers, programs, etc. were removed before the bombing. Presumably when the Russians evacuated the base, they somehow took all of it with them. Secondly, the bodies in the pit. He explained, as he looked at the faces, he knew the name of every one of them. That it was filled with the people he’d lived his life around every day. He said he had 100% certainty that pit was filled with the citizens of Kamensk. He also stated that he spotted execution wounds, shots to the head, etc. It’s unknown if grenades were thrown in later as a precaution, a reason, or is actually an effect of the bombs being dropped on the base. While he showed no signs of lying, and his emotional reaction made me believe he is telling the truth, his story has no way for me to back up, making it unreliable and only just that, the word of a man I met on the road. I still keep it in mind though. In my personal opinion; due to the leading up of events, missing evidence, mysterious background of the base itself, and symptoms, my personal belief is that this is 100% an artificially-man-made-virus. It’s possible its originations were in multiple known and organic viruses. Advancement in genetics, cell understanding, and splicing, explain how the virus could have been crafted together. My personal belief is that codenamed Wendigo Vitus, is a genetically-man-made-bioweapon. I think the bombing was either an attempt to stop something, or to cover something. Instead, or intentionally, it released the virus into the population, spreading it as the pandemic we currently know. Wendigo Virus is theorized to have originated at Kamensk Military Base in Chernarus. Believed to be a man-made-viral-bioweapon, the virus is similar to strands of other virus behavior, but does not directly match any particular kind. We cannot estimate the exact damage, as the virus has reached pandemic. The scale large enough in damage, that communication has been cut around the world. It can only be guessed that the scale is in the millions. Also, it becomes confusing because whiile the virus does not create actual death of a person, it results in a hybrid of violent predatory behavior and a coma vigil. The victims are not clinically dead, nor do they show any signs of self-awareness. The global scale damage is currently unknown, other than it could be hypothesized that we are seeing something along the same scale of the Black Plague during the middle ages. It is undetermined that any specific age range, culture, ethnicity, or other form of grouping has any differences in chances of getting the virus. I originally theorized Wendigo virus to be blood-borne and fluid-borne. This was judged by seeing both bite marks, and scratches, showing the same levels of inflammation and infection. The origin bite or scratch will have the most irritation and infection, while surrounding scratches earned via other methods will only show normal inflammation. In one case the man had not been bitten at all, only scratched. The World Health Organization after a few weeks, scientifically confirmed my theory of the virus being spread by body fluids. Morality is rather confusing on this topic, because the virus does not kill its host. Which also brings up many other questions. In terms of the virus’s ability to cause the clinical death of a human, I have yet to see a death from the virus alone. Those who pass to the third stage of infection, mimic predatory aggression as well as coma vigil. They do not seem able to make any cognitive decisions, understand or recognize speech, or respond to pain. Yet, unlike coma vigil, they walk around, run, eat, pursue, control locomotion, and balance themselves. I don’t have the technology or experience to test the brain, so for now, all I can do is theorize and back up those theories with what I see. Death truly comes when the brain and or brainstem is destroyed. Effectively shutting down any and all possibility of sustaining life in the brain. This is usually through traumatic manner, as we have no choice but to put them down when they attack us. These factors also bring about many questions that I have yet to be able to answer. They are producing urine and excrement, yet are not cleaning themselves at all. Several of these factors alone can easily lead to an excruciating death. Urinary tract infection can become a kidney and bladder infection. If not treated properly that can induce sepsis and the kidneys to shut down function. It’s almost undoubtable that the skin would get rashes, swell, form sores, form holes, and become necrotic. Falling off the body and creating a mass of decay in living tissues. There are also bugs and creatures who would use this to lay eggs, reproduce, eat, etc. There are also plenty of infected wandering around with already severely damaged body parts, the majority above would be the same for an open wound. We need to study the conditions, it’s possible this could trigger death in the bodies, only it would take time. The other thing, is the risk of contact with the matter, with so many wandering around, that in itself could spread diseases like cholera. There is currently no cure or vaccine available. There have been many instances of people having been bitten or wounded, who have not become symptomatic. This indicates there is some kind of mutation that genetically gives some people the ability to resist the disease. Some resist illness entirely, and some become sick, but their immune systems are able to fight off the virus. This leads us to believe that there must be some kind of immunity to the virus. We have yet to be able to place what that immunity exactly is. The best we can do is use common sense. Remain as quiet as possible, infected are drawn to noise. Especially loud noises such as engines, helicopters, automobiles, gunfire, flashbangs, explosions, shouting, loud music, musical instruments, etc. They are also attracted to light. If you are using an inside light, be sure that windows and anything else that could allow light through to be heavily covered. Be careful with outside fires and flares. If someone is bitten or scratched, immediately flush the wound with soap and as much water as possible. Saline solution also works. Then disinfect and wrap the wound. Remember that viruses can live on surfaces for up to a week. The person then needs to immediately be placed in quarantine for 24 hours. Typically symptoms seem to start to show in 4 hours. Allow them to clean themselves and take what precautions are needed to decontaminate them, as well as medical attention. If they pass the 24 hour window without going into stage III, they’re immune. It is possible for people to appear up to stage II before their immune systems fights off the virus. Do not assume that immediate illness means they will go to stage III. If going anywhere near a possibly infected person for care, or anywhere near a body, ensure to be wearing a full hazmat suit. A makeshift one can be made by using waterproof clothing with long sleeves, and duct taping any openings such as the glove to arm and pant to boots. Before removing the suit, be sure to decontaminate it. Clean the body well afterward. Ensure any clothing that has come into contact with bodily fluids is removed. Personally I do not suggest burning clothing, we don’t know if the virus is released into the air this way. Do not poke, or inspect corpses without proper protective gear. Clean objects and clothing with a diluted bleach mixture. 0.5% solution is good for floors, surfaces, bedding, protective equipment and gloved hands, corpses, body bags, mattress covers, packing for blood samples, etc. While we may be dealing with something we don’t quite understand yet, but we do have some knowledge. We do have the abilities and choices, to do the best we can, in order to make ourselves and others safe. Would love to know how and why the United Nations/WHO saw fit to send over personnel and doctors, yet managed to not send any kind of decontamination equipment or hazmat suits. UN personnel requested my assistance. They informed me that they had found an individual whom they had stopped from committing suicide and wanted an evaluation. I made it very clear that I am not a psychologist and am unable to do any form of psychiatric diagnostics. They stated that was acceptable and requested that I look over the patient and help however I could, until the correct personnel appeared. A young man in his early to mid-twenties was brought into the UN camp by guards. He was escorted to an area in the back of camp for privacy. I introduced myself and stated firmly that I am not a member of the UN or WHO, simply a volunteer doctor and wanted to check on his wellbeing. It turned out he man had been bitten on his leg by a grayskin, the day before. Grayskin is the term given by the UN for the infected people, or people suffering from stage III of the virus. Immediately placed young man into quarantine, which ended up being a side area of a barn. At the time we still did not know how the virus was spread. My personal belief that I had stated quite a bit to people, was that it was fluid-borne/blood-borne. Taking that into account, I made a makeshift hazmat suit for myself. Jack Ripley and Casper Hawk stated they were staying with me, both to keep an eye on the man and for my own protection. They stayed at the end of the room, close enough if something were to go wrong. Spent a good amount of time comforting the patient, held hand, hugged him, etc. Just listened to him talk, tried to ease his fears the best I could. Agreed when patient was ready, to be given a dose of sedative, non-lethal. Simply enough to help ease into sleep, and hopefully keep him from pain. Patient became extremely lethargic, eventually deciding to nap. The tachycardia and hypertension were climbing and he woke up and nodded to me, saying he was ready, and thanking us, for not letting him be alone. I administered the shot of Haloperidol 2mg with the two UN members present. The patient became unresponsive. I had Casper start a timer. While sedative was administered, nearly no drop in vitals, abnormal in comparison to sedation. I repeatedly stated patient’s name, attempting to communicate. Giving basic instructions. Hawk and Ripley also took turns talking to him from the side, he would turn his head in the direction of whoever was speaking. We essentially formed a sort of triangle. Whoever was speaking, he would immediately turn towards and act agitated. Patient was moving slightly, I felt muscle tone on his arm, physically felt very little push and pull muscle activity, if really any at all. Growl becomes louder and more agitated, patient continues leaning against the wall, then pushes off the wall to a standing position. Then attempts to punch me. The movement was uncoordinated, I believe again due to the sedative. His hand slammed hard into my left shoulder, a lot more power behind it than I had expected from such an uncoordinated punch. It took 6 minutes from the time of patient going catatonic and unresponsive, to attacking me, and be killed. This we found fascinating, as most stories I’d heard rumor of, and the reports told to Ripley and Hawk; were that it could be seconds to a few minutes for the catatonic state to happen, moving the patient from stage II to stage III. The infected and now stage III patient, would then suddenly and mercilessly lunge at and attack the closest person to them. Putting those statistics together, we agreed that somehow the sedative played a major part in keeping the patient from attacking for so long. A good amount of samples were taken by myself, and labeled by Casper Hawk to be sent to Miroslavl. While they were properly stored, the officers in Miroslavl upon receiving them, decided that anything sent by myself was considered unusable and resulted in the immediate disposal of all sent items. This included an extensive amount of notes and samples. 20 vials of labeled blood, several people contributed multiple vials, who claimed to have been bitten and then not become sick. As well as multiple petri dishes of attempted cultures of the virus and any bacteria. The patient’s body was cleaned, wrapped in some blankets, and placed in a body bag. The men buried him outside of the church, in the graveyard. Putting a sign with his name there. I cleaned the area with hospital grade chemical cleaners, and once those were dry and safe, bleach diluted in water. The men then sprayed my suit down allowing it to dry and I got out of it. We then disposed of the suit in biohazard bags. I again cleaned myself with soap and water and changed clothing. Due to various studies and reading, this paper works on breaking down the theoretical aspects of a scientific theory on how the brain is functioning. Without available resources and scientists, so far this information is simply as that, a theory. The observed behavior is nearly identical to an article of predator and prey instinct, done by Yale University. It concluded which parts of the brain actually trigger and must be active got the predator and prey instincts to function. The found that one set of neurons in the amygdala cues the mice to pursue prey. Another set controls the muscles used to bite and kill. By using optogenetics, they researches were able to effectively turn on these areas of the brain using a special light. The results were interesting. The mice would chase and bite nearly anything in their path, including bottle caps and sticks. A very interesting thing, was that mice did not, attack other mice in the cage. They also found that the rate of how hungry the mouse was, effected how aggressively it went after its prey. The study stated as well that if they lesioned the neurons associated with biting and killing, that the animals could pursue the prey but could not kill it. The biting force in the jaw was decreased by 50 percent. Another article from a Harvard Psychiatrist, lends insight into how if zombies were real, their brains would function. Information from both articles was very important in defining what we are actually seeing. Some residual cognitive function. An external stimulation, such as pain, still activates ‘primary’ sensor cortices in the patient. These areas are functionally disconnected from ‘higher order’ associative areas needed for awareness. Thus part of the cortex is still functioning. That means= senses still pick up signals such as pain, but the sensors to have the body be aware (feel and respond) are disconnected. Thus they feel nothing. May be startled by loud noises and appear to smile or frown (involuntary basic reflex, NOT a conscious action.) They may be aware of their surroundings. They may, like a baby, instinctively grab an object when it touches their hand. There are two dimensions of recovery from a persistent vegetative state: recovery of consciousness and recovery of function. Recovery of consciousness can be verified by reliable evidence of awareness of self and the environment, consistent voluntary behavioral responses to visual and auditory stimuli, and interaction with others. Recovery of consciousness may occur without functional recovery, but functional recovery cannot occur without recovery of consciousness (Ashwal, 1994). Most PVS patients are unresponsive to external stimuli and their conditions are associated with different levels of consciousness. Some level of consciousness means a person can still respond, in varying degrees, to stimulation. A person in a coma, however, cannot. In addition, PVS patients often open their eyes in response to feeding, which has to be done by others; they are capable of swallowing, whereas patients in a coma subsist with their eyes closed (Emmett, 1989). PVS patients' eyes might be in a relatively fixed position, or track moving objects, or move in a disconjugate (i.e., completely unsynchronized) manner. They may experience sleep-wake cycles, or be in a state of chronic wakefulness. They may exhibit some behaviors that can be construed as arising from partial consciousness, such as grinding their teeth, swallowing, smiling, shedding tears, grunting, moaning, or screaming without any apparent external stimulus. We know that various parts of the brain control various actions and behaviors, this is key on developing information later. This would a basic science view of the areas of the brain and what it controls. Frontal lobe (thought process)- must be active enough to receive direction from the thalamus (sensory input). 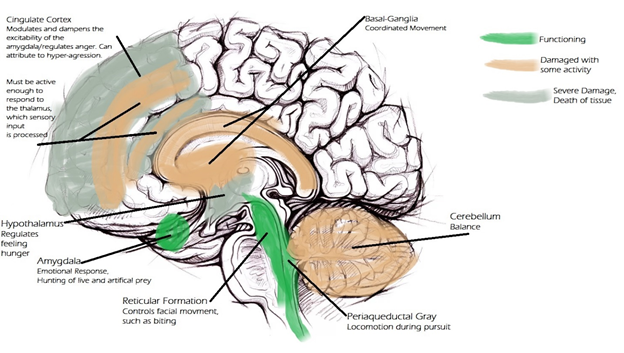 Cerebellum (balance) and Basal Ganglia (coordination) together = (make motions smooth/fluid)- degeneration of this area (ataxia) can cause "a wide-legged, unsteady, lurching walk, usually accompanied by a back and forth tremor in the trunk of the body…"
The Ventromedial Hypothalamus- (the region of the brain that lets you know whether you've eaten enough.) If damaged the result is hyperphagia. You will eat and eat and eat, but never feel satiated. Aphasia, or the loss of ability to understand or express speech. Attention, working and short term memory, prospective memory, hypothesizing scenarios, metacognition, problem resolution, shifting, planning, etc. Sensors disconnect, meaning while the body feels painful stimuli, they never make it to the area that processes it into awareness. This would be a diagram of a normal working brain, along with the areas and function. Doctor Hawk did state that the frontal lobe was damaged, while helps push my theory towards probability. 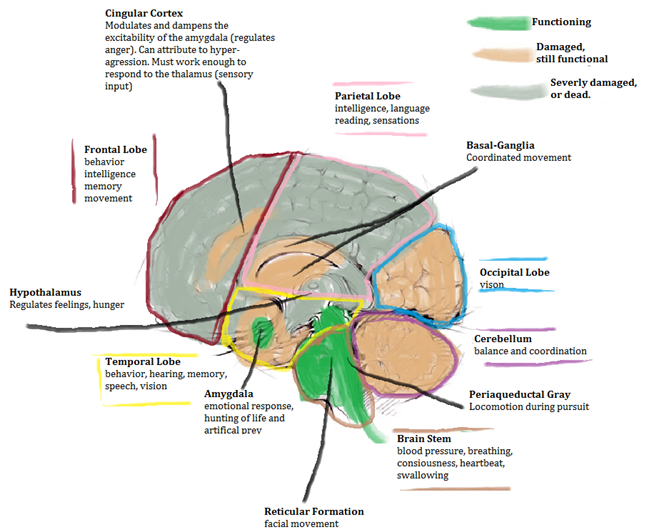 Now, to get a full idea of brain function, I looked at what we don’t have labeled. 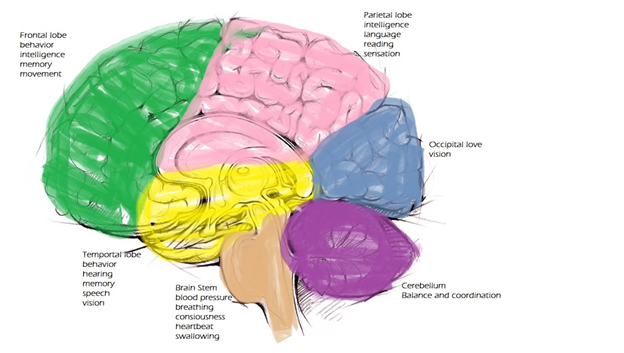 Parietal Lobe- intelligence, language, reading, sensation. Judging by the actions of the infected, along with the above chart. I can then create a more intricate diagram of how I believe the brain to be functioning. My personal belief is that the image shown above is how we are dealing with the brain function at stage III. The virus either is going in and damaging healthy tissues in the brain, or outright killing areas. The brain has to be active enough to function, but with this type of damage, the virus is taking any kind of free will away from the host. The host no longer has any concept to even fight back, because that part of the brain has been either damaged or completely destroyed. What I also find interesting and makes sense for a virus, is how accurate the damage is. If this is truly what is happening to the brain, certain areas of the brain are being shut down, while areas within the same parts are not. It’s extremely accurate in what it’s attacking, what it’s destroying, and what it’s allowing to function. I believe this change takes place between stages II and III. Stage II the brain is still functioning and the person is cognitive. Though they quickly reach a point where they become trancelike, nonresponsive. I believe this point is where stage III is advancing, causing the worst damage, shutting down the centers that define the self. This is when I believe however it is, that the virus is destroying or damaging the various areas of the brain, fully taking over control. Usually once the person goes into this state it’s not long, until without any warning or indication, they savagely attack the closest person to them. Due to the fact as it appears the brain is being damaged, these injuries are irreparable. 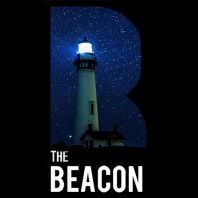 If what we are seeing is a coma vigil, it would be possible that there could be varying levels of consciousness in people. At the same time I feel this is not probable, as everyone in stage III to the best of our knowledge, has responded the same, no one has shown any signs of varying levels of cognition. As difficult as it is to say, especially on such a huge scale, suspecting the damage starts in stage II, and completes in stage III, there will be no possibility of a cure. If the brain tissue is dying, there is no way to heal and or to regrow it. Unless the virus can somehow be directly halted in the very beginning stages of stage II, before it’s invaded the brain and started causing damage. In stage III, minus the ability to move freely, the person is in a coma vigil. If that is truly the case, there is no way to regrow damaged brain cells. Even if we somehow managed to turn off the receptors that make them attack, the prognosis for them to ever make any form of recovery, is nonexistent. They will need constant care, constant medical attention, and will never gain any kind of control back. The best thing we can try for, is a vaccine against the virus. As well as possibly something that could aid in curing or having the body fight off the illness in the first stages. Beyond that, stage II infects the brain and begins causing damage, then moves quickly to stage III, where any changes become irreversible. This is so well put together and thought out, love it.